If you are just starting out, fluid painting is incredibly entertaining–and sometimes a little frustrating. 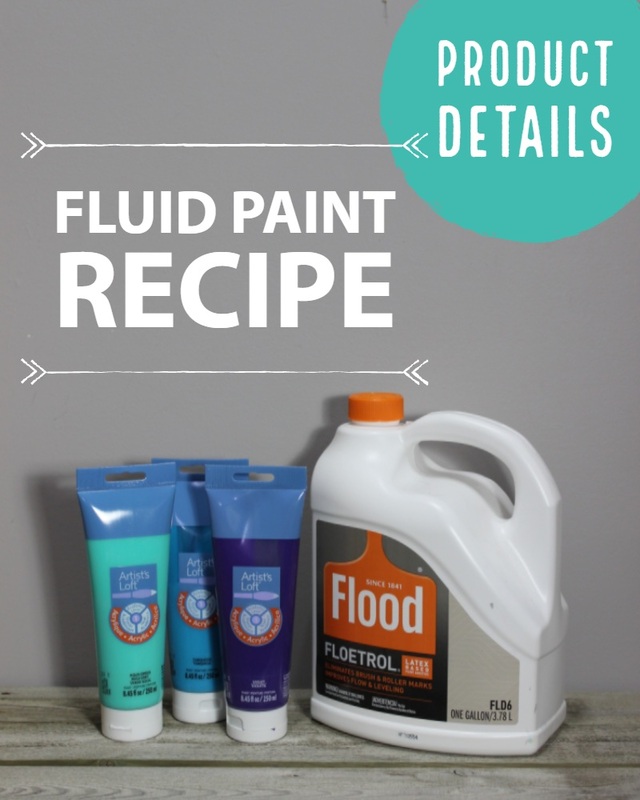 If you are an artist on a budget, mixing your own fluid paints is a great idea. When I first started, I had mixed cheap craft paints (Apple Barrel, Folkart) and water to play around with fluid painting and it gave me a good feel for consistency needed. I practiced on canvas paper so I didn’t waste more expensive supplies. If you want to try this route, make sure to tape the canvas sheet down onto a rigid backing like cardboard or plywood. Just mixing paint and water can cause paint pigments to separate and create a grainy look once dry. Adding a medium helps keep everything bound together while drying. PVA glue as a medium works great for practicing, but Floetrol is fairly cheap and is meant to be combined with paint so I prefer this as a cheap medium. But if you want to know exactly the recipe that I use on a lot of my fluid pieces these days then continue reading! To begin, I mix 1/2 Floetrol and 1/2 acrylic paint with a wooden stir stick. I stir this until smooth, then add water and stir until the paint flows off of my stir stick when lifted up. You can achieve different variations of ‘flow’ that will still work for painting, so an exact measurement of water isn’t needed. Or–use any other soft body/low viscosity paint like Liquitex Basics. (Soft body paints are much easier to mix than heavy body and are less likely to have clumps in the mixture. Cells can form naturally with the above mixture, but if you are looking for dramatic cells you will want to get silicone and add a couple of drops to your paint mixtures. Personally, I don’t like using silicone as it create pits in your paint and leaves a residue on your canvas once dry that needs to be cleaned off before varnishing. The painting looks fine when wet, but turned into a big hot mess after drying- You probably had too much water in the mix. The painting has cracks after drying- You may need more medium and more water in your recipe. Also, try tilting more of the paint off the canvas to there aren’t thick spots. The paint won’t spread- You need more water. Stored paint can separate, but just shake before using and you’ll be fine. I don’t mix silicone into my stored paints as a personal preference. It would probably be fine if you did, but just make sure to shake before use.